So this is going to be my first non-enterprise IT related post. One of my friends called me to help their son install a new PC game that just came out called APEX Legends. He was receiving the following error messages, which I realized was a bigger issue across the internet. This was the most popular fix, but many people, like my friend’s son reported that this doesn’t work. I’ve also confirmed that this by itself does not work. Re-install NVIDIA drivers to the latest version. And once again I’ve confirmed that this by itself does not work. I also did some major registry deep-diving and Windows Event viewer troubleshooting that led me no where. After many rounds of trying different things (several hours), I’ve finally came across one thing that was a surefire fix. After you have your files looking like this, right-click on DXSETUP.exe and choose run as administrator. You should get a successful installation error message. Launch the game again and it should work without error. Feel free to post here if after executing these steps, the issue still happens. On the contrary please let me know if the issue is fixed! I want to give a big shout out to EA for horrible support, horrible release and just being a horrible company overall. Keep up the great work! EDIT: A couple people have already offered to buy a cup of coffee for saving them from several days of troubleshooting. Feel free to do so here! Appreciate it! I can go to C:\Program Files86\Origin Games… but from there, there is no Apex folder. Origin isnt letting me Install the game at all. It just keeps giving me the same error message about the DirectX issue.. Finally a website with a fix that work, thank you and keep up the amazing work! Great article, but after deleting all .cab files and running the setup I was greeted with the same message. What should I do? @ALL – To all those who commented a thank you – You’re welcome! Happy to have saved you some trouble. To the others who have commented that you’re still having an issue. I’ve sent you direct e-mail messages to help you troubleshoot what’s going on. Still having this problem. I’ve tried everything from reinstalling all those C++ programs to deleting/renaming/updating any directX related things, updating drivers and even troubleshooting via cmd scan for corrupted files. At this point I’m just tired and not even interested in the game anymore :< Reinstalled it 8 times, repair tool via origin .. sometimes it gets stuck at 38 or 39% with the "directx" error, sometimes I can get it to download the full game and get the message at 100% .. if I then delete all the files like you posted above the game doesn't realise any errors but if I launch the game then it says: "There's a problem with your game's setup. Please reinstall your game." hey, i’ve done what you’ve told me to do, but to no avail, i still cant get it downloaded . what else should i do ? Hey ! i’ve done what you’ve told me to do but i still couldn’t get it to install. same error. what do i do ? Hey, i’ve done the steps but i still couldn’t install it . what can i do ? Not sure why, I’ve done everything you’ve said and still nadda. Thanks for trying though. OMG I was tearing my hair out and this fixed it! I do have one question that I’m not sure you can answer but this seemed like the best place to ask: I’m having a similar issue with other Origin games. Is there a method you used to determine which .cab files to keep for the specific game? Literally all these screbs are like just reinstall origin and im telling them it doesn’t work. Thank you, Nick, for actually finding out how to fix it, very very grateful. Noah – thanks man. This comment made my day. Nice piece of troubleshooting there. It’s appreciated. As for EA, don’t change a thing. Keep being the team that serves as a bad example. Lol’d at your EA comment. Thanks dude. Thanks for the fix, I have created a write up on a python script that will automate this for all the games. This is awesome – thanks for putting in the work on this. I’ll update the post with this info if anyone has to do this for multiple games. i’m not a gamer, so when my bf told me to play it, i didn’t know installing it would be the most difficult part. I know – I’m not exactly sure why this happens but it’s EA, so I’m not sure we’re supposed to know why. I tried every single thing above. Nothing seems to work. I even reinstalled Origin and Apex multiple times. What more can I do? I had the same issue and I finally managed to solve it and start apex and it runs! After the fix described in this article the installation of directx will run without an error, but apex still won’t start, at least for me. So I took a closer look on what’s happening and found out, that if you just delete “apr2006_d3dx9_30_x86.cab” it’s working fine, at least for me. I have a 2060 RTX and the issue with “apr2006_d3dx9_30_x86.cab” might be related to that new graphics card. the log will end with the last installed package and you just need to delete the upcoming one from your install folder (C:\Program Files (x86)\Origin Games\Apex\__Installer\directx\redist) and your good to go. There is no .cab files so what am I suppose to do now? I just deleted all the files and left those that you said must be left but I didn’t have any .cab files but I still followed your instructions and it all worked out in the end so THANK YOU VERY MUCH! 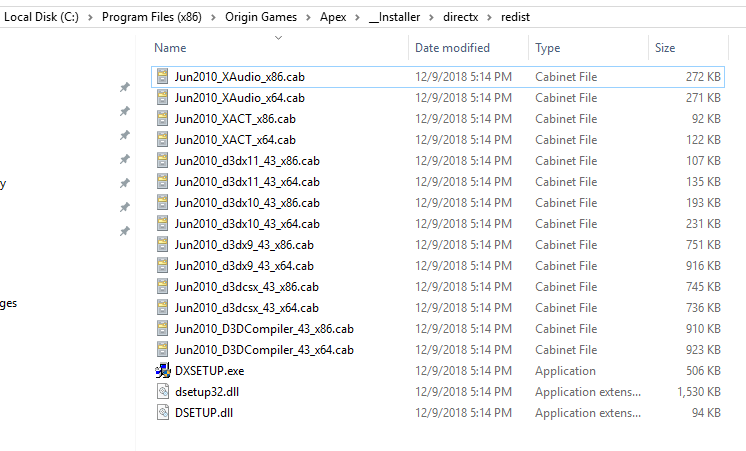 Hi, I found that deleting all the CAB files in the redist folder, then running the .exe as admin worked and allowed me the option to start playing. Also from another youtube file I took the step of disabling the Origin In Game For Apex Legends. This allowed it to give me the “Play” icon. Knowing this had stopped at 40% I have now started to download the rest of the game, I will update if there are any other erros. Might be a little too late, but I found also keeping dxupdate and dxllreg_86 work for me. If I did not kept those files, it would have an error, hope this might help someone.